The Club Donatello Hotel, San Francisco, California, guest rooms are super-sized (400+ square feet) and designed for your comfort. These hotel/studio suites accommodate up to 4 people but are most comfortable for 2 adults. Most guest rooms include one king bed and one queen sofabed, while on request 2 double beds and a queen sofabed may be available. All guest rooms have one private full bathroom. There are no kitchen facilities. 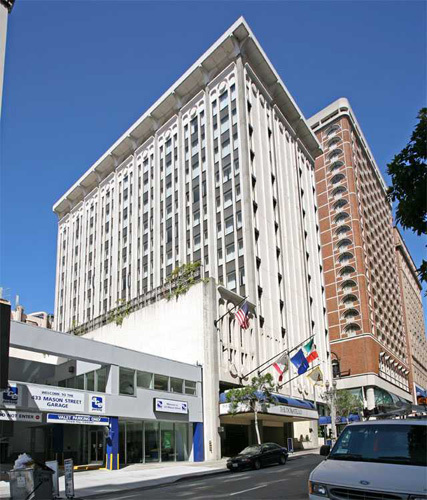 Excellent Downtown and Union Square location on Post Street. Club guest rooms are normally on the top 3 floors of the hotel, for great views and less noise. Compare at $200 to $300 per night, plus taxes, if rented directly from the resort (source: clubdonatello.org). Other than daily parking fees (varies with lot chosen, but $20 to $30) and a $25 housekeeping fee (collected at check-in), the prices shown are the TOTAL prices. There are no other additional charges (such as sales or lodging taxes, deposits, booking fees, etc.). The price you see is the price you pay! If you prefer, we also accept debit payments, through Chase Person-to-Person Quick Pay, American Express Serve, or Wells Fargo. The Club Donatello Hotel is a Four-star, Gold Crown-rated boutique hotel, providing an intimate ambiance in the heart of San Francisco’s Union Square. Club Donatello, located just steps from Union Square, is your perfect choice, whether in San Francisco for business or vacation. Club Donatello invites you to experience its gracious hospitality and the myriad social and cultural activities of the Club and the City by the Bay. Club Donatello offers its guests full hotel services. If you are in San Francisco for fine dining, shopping at Union Square, attending the Best of Broadway or the Symphony or Ballet, attending a conference at the Moscone Convention Center, or simply enjoying our beautiful city, let Club Donatello be your pied-a-terre in San Francisco. All hotel/studio suites include color cable TV, sitting area, coffeemaker with complimentary coffee, hair dryers, private phones with voice mail, and complimentary wireless access. San Francisco is one of the most beautiful cities in North America, if not the world. It is certainly high on everyone’s list of places to visit. It is also a small city. Its attractions are located in dense concentrations making walking tours very enjoyable and easy to do. While the city is small and its attractions concentrated, San Francisco also has many micro-climates and topographic differences. The city may be enshrouded in fog on the west and north sides and basking in sunshine downtown at the same time. The hills of San Francisco are as legendary in North America as the hills of Rome. In addition, San Francisco is surrounded by beautiful countryside, vineyards and wineries, coastline and Redwood forests, and islands in the Bay. Plan to spend some time to visit the neighboring counties of the Bay Area. San Francisco is famous for its great cuisine and world-class restaurants which reflect the cosmopolitan tastes of the Bay Area and California. No matter what your preference in flavors, styles and ethnic cuisines, you’ll quite likely find it in San Francisco. San Francisco is a visitor’s dream. And the Club Donatello is the place to start dreaming. Within a small radius you will find many of the City’s cultural, and scenic attractions. If you want to explore farther out, public transportation and a car rental company are outside our door, as are San Francisco’s iconic cable cars. San Francisco is the home of the 49ers and the San Francisco Giants. Across the bay in Oakland are the Raiders and the Oakland A’s. Fans of hockey will have to travel down the San Francisco peninsula to San Jose, in the heart of Silicon Valley. There is more to the Bay Area than San Francisco. Redwood groves, vineyards and wineries, scenic shorelines, amusement parks, art colonies with occasional open studios, organic farms and artisan cheese makers and bakers surround the bay. The technology giants of Silicon Valley are just down the San Francisco peninsula in the southern edge of the bay. San Francisco has world-class shopping at Union Square and at the San Francisco Shopping Centre – well-known names like Tiffany’s, Gucci, Versace, Ralph Lauren, Saks, Macy’s, Bloomindales, Gump’s, Levi Strauss, Nieman Marcus, Abercrombie & Fitch, Kate Spade, Coach, among many others – are all within a few short blocks of the Club Donatello. For a comprehensive overview of the shopping opportunities in our Union Square neighborhood, visit UnionSquareShop.com. All photos courtesy of The Club Donatello Hotel.